Kitchfix, a Chicago-based company, grew out of Chef Josh Katt’s previous career preparing highly nutritious and functional meals for customers who were fighting cancer. He maintained those health-first principles as he grew his home meal delivery service and a packaged goods division centered on Paleo, grain-free granola in a variety of flavors. Even with all of these Good Food qualifications, Katt determined that he owed Kitchfix customers even more detail about where his ingredients come from — and whether they are organic and/or local, or conventionally produced. So over the past few months, he and his team developed the Kitchfix True Food Transparency program, the subject of the article below. 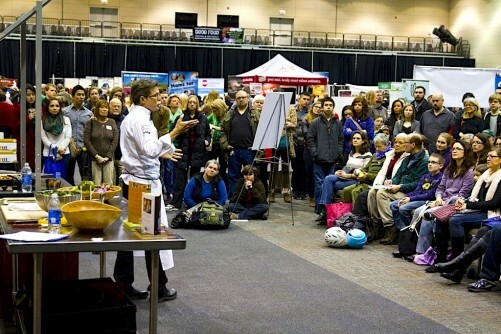 Kitchfix has become a regular at FamilyFarmed’s Good Food Festival & Conference. In this photo, chef-owner Josh Katt (in white shirt) discussed his products in 2015 with Illinois Gov. 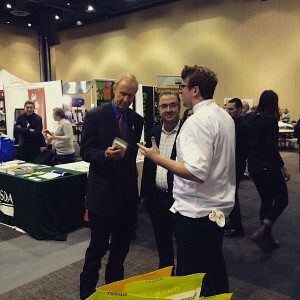 Bruce Rauner (left) and Jim Murphy, chairman of Chicago’s Local Foods and MightyVine tomatoes. Katt is a graduate of the second cohort (2015-16) of FamilyFarmed’s Good Food Business Accelerator, and has become a regular at the Food Court in the Exhibit Hall at our Good Food Festival & Conference. Kitchfix will again have delicious treats available for purchase at the Good Food Trade Show on Friday, March 17 and the Good Food Festival on Saturday, March 18. Click here to purchase tickets for the Good Food Financing & Innovation Conference (Thursday, March 16) and the Good Food Trade Show & Policy Conference (Friday, March 17). The Good Food Festival on Saturday, March 18 is, for the first time, providing free admission. Please click on the following links to read an overview of the Thursday programming and an article about highlights of the Saturday Good Food Festival — the annual FamilyFarmed Chef of the Year Award, to be given to Chicago’s Honey Butter Fried Chicken, and the Chefs at Play demos featuring Rick Bayless of the Frontera Group, Rob Levitt of The Butcher & Larder at Local Foods, and other local culinary stars. Kitchfix is a Chicago company that built its meal delivery business on a commitment to sourcing as many locally and sustainably produced ingredients as possible. But owner Josh Katt recognized that more and more consumers want to know — with some exactitude — where their food is coming from, and increasingly are demanding that producers be upfront about it. That prompted Katt to develop the Kitchfix True Food Transparency program, which the company is rolling out this week. Katt — a graduate Fellow of FamilyFarmed’s Good Food Business Accelerator program — explained how the informational program works. Katt explained that even a company such as Kitchfix, which has the best of intentions in terms of Good Food sourcing, can run into bottlenecks in the supply chain that require occasional compromises. The Transparency initiative was driven by determinations that providing full information about Kitchfix’s ingredients was the right thing to do for customers — and therefore was good for business, too. At the top of the document are two pie charts that show how much of their produce (by weight in the current week) is organic and how much of the produce and proteins by weight are sourced locally. 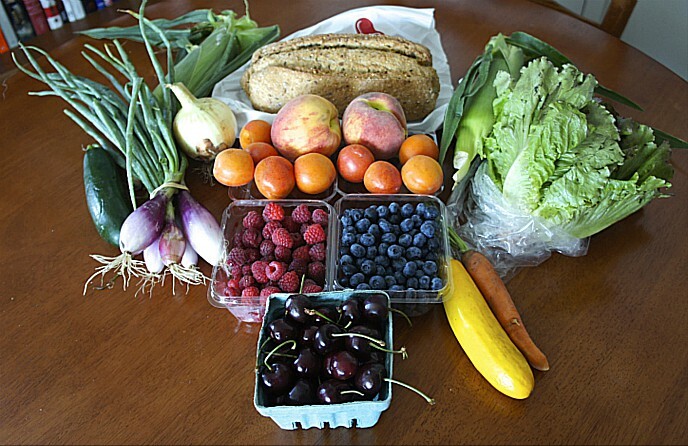 In the information dated Feb. 21, 69 percent of the produce was organic; 37 percent of the produce and proteins was locally produced, not a surprising number considering the limited supply of local produce during the winter in the Chicago region. 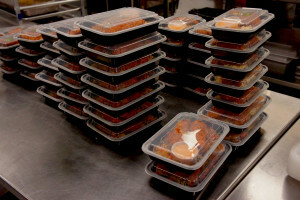 Prepared meals stacked in the Kitchfix kitchen. Katt views the Kitchfix True Food Transparency program as not only a way to burnish his own business’ credentials, but also to prompt consumers to demand more openness from other food providers — especially those making “local and sustainable” claims that Katt believes are misleading. 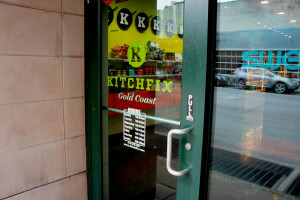 Along with its meal delivery, catering and supermarket retailing operations, Kitchfix sells prepared meals and snacks in its own store in Chicago’s Gold Coast neighborhood, just north of downtown. Kitchfix will have some of its delicious menu items for sale at the Food Court at FamilyFarmed’s Good Food Trade Show on Friday, March 17 and the Good Food Festival on Saturday, March 18. Transparency graphic courtesy of Kitchfix. Photographs by Bob Benenson/FamilyFarmed. 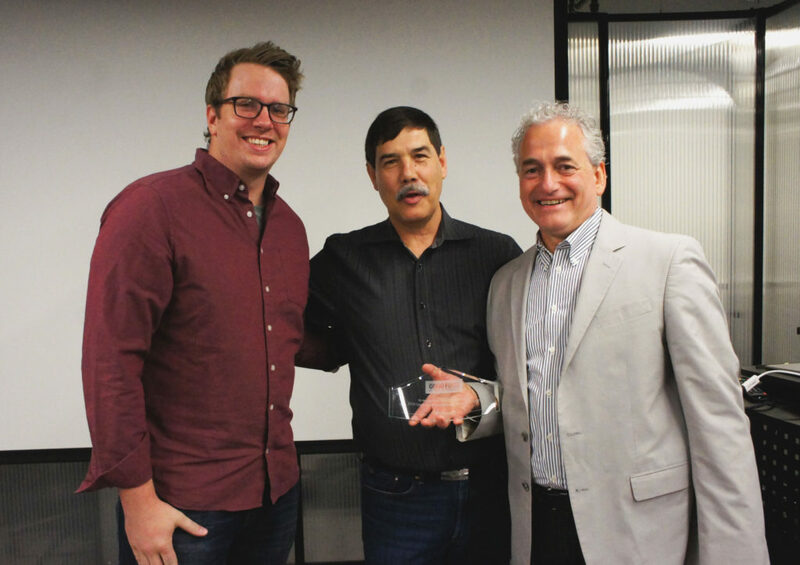 Josh Katt (left), chef-owner of Chicago’s Kitchfix meal delivery and Paleo granola company, celebrated his graduation from FamilyFarmed’s Good Food Business Accelerator in April 2016 with Michael Bashaw (center), president of Whole Foods Market’s Midwest region, and FamilyFarmed President Jim Slama. This entry was posted in Food and health, Food Artisans, Food Entrepreneurs, Food labeling, Functional foods, Good Food Catering and Home Delivery, Good Food Festivals, Nutrition, Sustainable food retailing, Transparency and tagged Chef Josh Katt, Food ingredient transparency, Good Food Court, Good Food Festival, Good Food Festival & Conference, Good Food Trade Show, Kitchfix, Local food sourcing, Organic food sourcing, Sustainable food sourcing, Transparency. Bookmark the permalink.